the pink toque. a craft blog: This Blog Has Moved! Just a head's up... 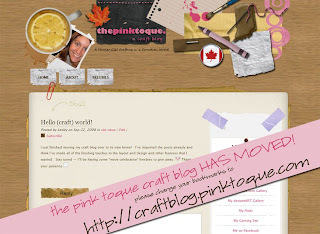 I have officially moved the pink toque craft blog to a new home, hosted by my webhost and now using the Wordpress engine for better functionality and design control. (check out the screenie, sweet, huh?) I've already submitted my new blog address to DigiFree's site and am hoping that it'll be able to pick me up over the weekend when Maria has a chance to add the latest batch, and so you'll soon be seeing my freebies again advertised on the DigiFree blog like they should be. (or http://www.pinktoque.com/craftblog, whichever suits your fancy) ! I will no longer be posting freebies here and you'll only be able to get them at the new blog site.